Lose That Girl: RATE IT! 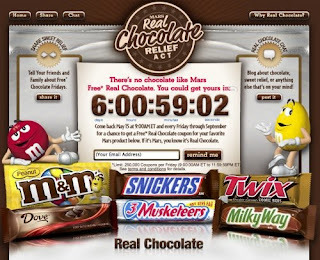 Mars Real Chocolate Give-away!!! The brilliant folk at Mars (makers of M&Ms, Three Musketeers, Twix & other delectable chocolatey treats) is giving away FREE CHOCOLATE *every* Friday through 'til October! The Mars Real Chocolate Relief Act is basically an awareness campaign regarding *real* chocolate. Many products out in the marketplace say they're "made" with chocolate or have chocolate flavouring -- but truth be told, they don't contain the real deal (how dare they!). Mars is proud to state that they produce all their products with honest to goodness real chocolate. And for that, I love them! While I wait for you to pass the M&Ms, you might want to bookmark their site in order to take part in this real chocolate love-fest this Friday. Enjoy!